Does it count as innovation if someone combines two products into one? I’m not so sure. One year at the CES trade show, a company displayed a child’s potty that had a stand for an iPad. Another year at CES, I encountered a gym bad that had a battery-powered speaker built into a side panel. Clever, I guess, but not very practical. 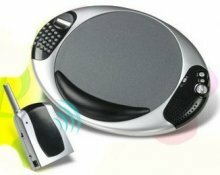 Then there was the device released a few years ago that merged wireless speakers with a mousepad. But there is at least one combo gadget concept that deserves some serious attention. It’s the modem-router combo. We typically by modems and routers as two separate products. The modem connects a single computer to the Internet through the phone or cable system. If you want WiFi — and who doesn’t? —you also need a router. And not just any router, it has to be one that works with your brand of modem and you better be prepared to do some configuring and tweaking. In the past few years, cable companies and other Internet providers have begun offering modems that come with a router built into the same package. That reduces set up issues and they often cost less than buying two separate products. Cable and IP services typically offer modem-router combos for a monthly rental fee but you can also find dual-use devices for sale and buying one outright often saves money. And tat’s my idea of innovation.